Like many hip-hop/R&B producers, I've relied on the trusty Akai MPC-series of drum samplers to get me through many productions. Software DAWs never quite got the feel right, although things have been getting better over the years. A pamphlet for BPM caught my attention at the recent NAMM show and after sitting through the demo presentation, I knew MOTU had something special. After a quick read of the manual, I proceeded with installing the application on a PC (AMD Phenom 9550, with 4GB RAM and two 1TB SATA HDs). I use an E-mu 1818m audio interface in addition to an E-mu XBoard49 and M-Audio Trigger Finger controllers. The installation is carried out in three parts. First, the installation of the iLok driver, followed by the installation of BPM itself, and finally copying the sound library to the specified location as instructed in the manual. The sound library content may take a while to install depending on the speed of your DVD drive (dual-layer drive required). The installation went well. Following completion,I clicked on the BPM desktop icon and was presented with BPM's main screen. Windows: Pentium 4.1 GHz or equal AMD with a minimum of 1 GB of RAM and at least 18 GB of free hard drive space. The first thing that stands out are the 16 large pads laid out much like those of the MPC-series. Above the pads is a faux-LCD display, where all sequencer and editing activity can be viewed. Overall the interface is intuitive and self-explanatory. Most functions were obvious at a glance, and there were few times I needed to refer to the manual. The graphics are well laid; my only gripe is that certain items can be hard to read due to their small size. Setup was pretty straightforward. Once installed, audio and MIDI interfaces can quickly and easily be selected and configured. I was surprised to see that BPM allows users to configure all audio interface parameters including sample rate as well as buffer size, all of which can be modified if necessary. BPM also features an audio routing section for configuring separate outputs for instruments. I was glad to see that I could simultaneously use both my Trigger Finger and E-mu Xboard 49 controllers. I found the included patterns to be quite good and easily usable as-is, as starting points, or to provide inspiration. Editing the patterns was easy in the LCD Seq screen and I was quickly programming my own patterns using the step sequencer in the large LCD window. Assigning the Trigger Finger pads to trigger BPM pads was straightforward thanks to the MIDI learn function. The groove parameters were a one-for-one match with my trusty MPC. Between the swing percentages, POS and VEL controls, I was able to tweeze the eighth and sixteenth notes to add just the right amount of attitude. Using just these controls and the included patterns offers thousands of groove possibilities. BPM includes 15 GB of sound content in 24bit/96kHz format, and the vast majority of material is really impressive. In addition to drum samples, BPM's library includes instrument samples such as keyboards, bass, and guitars,designed to be recorded into the racks section of BPM. BPM features two racks used for sequencing melodic instrumental sequences. The included sound content was very usable and lends itself well to popular, commercial styles as well as underground styles. BPM's entire cost could be justified by the sound content alone. Each rack can play multiple parts. In this way an entire groove can be assembled including all necessary instrumentation. Another major BPM feature is "SP mode" which faithfully imbues the grungy 8-bit sound of E-Mu's classic SP-1200 drum machine on either of the banks or the rack. With the option to activate it separately on each bank, you can mix and match to achieve interesting combinations. For those reliant upon loops for beat creation, BPM lets you drag and drop loops to any part of the rack section. Once the loop has been dropped, it can be played back as an instrument, or edited in the audio editor, where slices can be individually looped and triggered using a controller. BPM includes a synth section, with filter and amp sections. This lets you customize any sound, including individual hits, loops and instrument samples. I found tweaking the sounds to be easy and fast since the controls are right there in your face and invite tweaking. This is a significant advantage over hardware drum machines that require digging through menus to get at the controls. The synth section also includes a manual pitch control and pitch envelope. One of the coolest things about BPM is user-sampling. Ironically, very few software samplers actually sample. Select a destination pad for newly recorded samples, select a source (you can even resample BPM's output, a feature I haven't seen since the Ensonic ASR-X), and you're ready to go. Once recorded, BPM's usual editing tools can be applied. BPM also features a useful mixer section, allowing control of volume, mutes, solo status of pads as well as banks, racks, and aux send, and the master bus. Additionally, each pad and rack track has its own volume, mute, and solo controls. When used as a plug-in, BPM offers 18 stereo outs to your DAW's mixer. The Effects section features numerous routing options and can be inserted on parts, banks, and aux sends as well as the master bus. It includes the usual suspects such as reverb, delay, EQ, compression, etc. Tempo-based effects sync to the host tempo. To organize sections of your groove (intro, verse, chorus, etc. ), BPM uses scenes. A scene can be made up of banks and racks, each with variations comprising different song parts. Once all the scenes are in place, song mode lets you arrange scenes via drag and drop. Each pad represents a different scenes making the whole process very intuitive. This method can also be used live to trigger scenes on the fly. The 189-page manual is a good reference and I highly recommend going through at least the introduction, the installation section and the two tutorial sections. From that point you should be pretty comfortable getting around BPM, but keep the manual handy in case you get stuck. BPM is a force to be reckoned in the drum machine world. 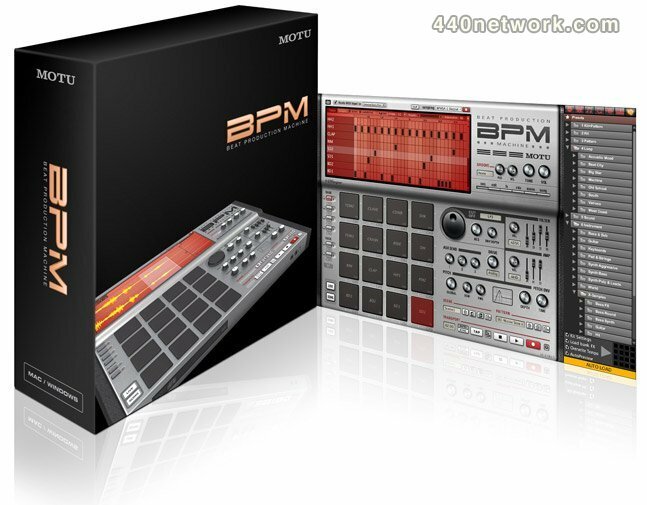 With its huge library and strong feature set, BPM can easily hold its own compared to hardware drum sequencers. BPM's compatibility with all major DAWs deserves bonus points. I would have liked to have seen a MIDI programmable sound repeat button as well as a hi-hat decay slider as on MPC drum machines- perhaps in a future update. Nonetheless, BPM is by far the strongest software drum machine currently available. I'll be looking to see how musicians find creative ways to use BPM, much like the MPC, but in my opinion, MOTU may have officially put all hardware drum machines on notice.